He heard the dog all the way from the other side o’ town? I reckon that’s one mighty good pair o’ ears, or a mighty small town. 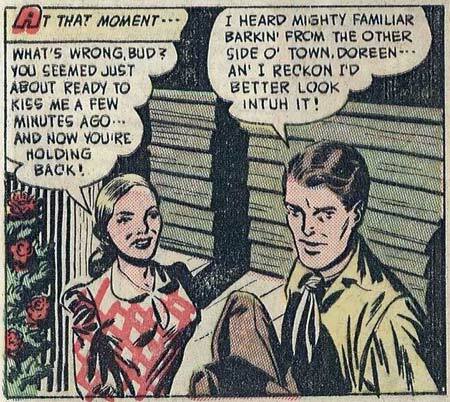 He can hear a pooch yelp from ‘cross town, but th’ yahoo cain’t done hear th’ filly want’s ta git frisky?? Wow. The ‘Little House on the Prairee’ comic was weird. Maybe she’s got halitosis or really bad teeth and he’s just making an excuse to get out of there.